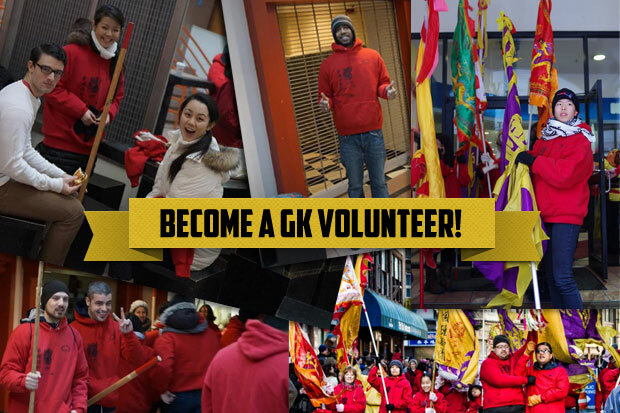 Call for 2015 Chinatown Lunar New Year GK Volunteers! We need YOU! Help ring in the upcoming Lunar New Year (Year of the Goat) with the Gund Kwok Lion and Dragon Dance Troupe, as they parade through the streets of Chinatown and lion dance for the stores and restaurants, as well as perform on the main stage on Sunday, March 1st. Gund Kwok is one of 8-10 troupes performing that day. You also get to experience an unforgettable day of Chinese New Year sights, sounds, and smells! Gund Kwok, the only Asian Women Lion & Dragon Dance Troupe in the United States, was established in February 1998 to give Asian women an opportunity to express their creativity, power and strength through performing the lion and dragon dances. You will be assigned to be a flag carrier, crowd control person, runner, cart lugger, photographer, videographer, or helping with miscellaneous tasks. You will get to borrow and wear a Gund Kwok hooded sweatshirt to identify that you are with the Troupe. Please dress in layers and wear hats, scarves and gloves/mittens. Please wear black pants and comfortable, appropriate footwear. Ear plugs, hand and toe warmer packets are provided if needed. Please do not carry any backpacks or other bags on you – personal belongings may be kept at the GK “Den” (someone is stationed during the entire day to track the comings and goings of all volunteers and troupe members, and to keep an eye on your belongings). Days prior to the Festival, you will receive documents and information for the day of the Festival, including FAQ’s and Volunteer Role Descriptions, and information for the Gund Kwok Volunteer Liaison (your main volunteer contact on that day). Take public transportation. Street parking is virtually non-existent on the day of the event. MBTA: Green Line – Boylston Street T stop; Orange Line – Chinatown or New England Medical Center T stops, Red Line – Downtown Crossing or Park Street T stops. ← MFA Boston Lunar New Year Celebration on Sat, Feb 21, 2015!